Another method useful in dealing with caustics is Gaussian beam tracing (e.g. Porter and Bucker, 1987; Bucker, 1994), which has been adapted from seismic applications. This method associates with each ray a beam with a Gaussian intensity profile normal to the ray. A pair of differential equations that govern the beamwidth and curvature are integrated along with the standard ray equations to compute the beam field in the vicinity of the central ray of the beam. This method avoids certain ray-tracing artifacts such as perfect shadows and infinite energy levels at caustics. Furthermore, this technique is attractive for high-frequency, range-dependent applications in which wave-theoretical approaches might not be practical alternatives (see Section 4.4.2). Although ray-tracing techniques are theoretically applicable to fully range-dependent (3D) problems (refer to Figure 4.1), they are rarely implemented as such. The mathematical complexity discourages 3D versions in favor of 1D or 2D versions. The 2D versions can be implemented by one of three methods: (1) by mapping rays over discrete range intervals in which the environment remains constant (Weinberg and Dunderdale, 1972; Weinberg and Zabalgogeazcoa, 1977); (2) by dividing the range-depth plane into triangular regions (Bucker, 1971; Roberts, 1974; Watson and McGirr, 1975); or (3) by allowing the environment to vary smoothly as a function of range, through the use of cubic splines (Foreman, 1983). These methods are explained in the following paragraphs. A significant problem that confronts range-dependent ray-tracing programs is the proper representation of the transition of sound-speed profiles between adjacent measurement points in the range dimension. Two aspects of this problem are important from a practical standpoint. First, the interpolated intermediate sound-speed profiles should be physically plausible. Second, it is desirable that the resulting ray trajectories be analytically computable (versus numerically integratable) in order to maximize computational efficiency. In method (1) (Figure 4.5(a)), rays are traced in the first range interval. Selected rays are then mapped into the second interval, and the process continues throughout the remaining intervals. Drawbacks to this approach stem from discontinuities in ray tracing at the boundaries between adjacent intervals, and also from the potential omission of important rays in the selection process at each boundary. In particular, as the water (or duct) depth decreases, rays can properly be eliminated. As the depth increases, however, there is no valid and consistent process for adding new rays into consideration. Figure 4.5 Range-partitioning techniques: (a) discrete range intervals and (b) typical network of triangular regions formed by connecting corresponding features between two adjacent sound-speed profiles (Roberts, 1974; Watson and McGirr, 1975). In method (2) (Figure 4.5(b)), the input sound-speed profiles are represented as piecewise-linear functions of depth. 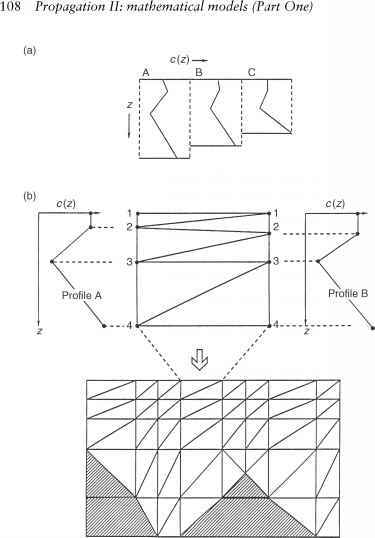 Then, the range-depth plane between specified profiles can be divided into triangular sections within which the sound-speed varies linearly in both range and depth. In each sector, ray trajectories then correspond to arcs of circles for which analytical ray-tracing programs are available (e.g. Urick, 1983: 124-8). Each triangular sector is selected to provide a smooth and physically realizable transition between adjacent profiles. The vertexes are commonly selected at those depths representing sound-speed minima. Otherwise, the triangular sides are selected to subtend the gradient that departs least from the gradient of the preceding triangle. These procedures generally require the expertise of an oceanographer to ensure the generation of realistic intermediate sound-speed profiles. One tries to maintain continuity in features such as the SLD and the sound channel axis. In method (3), the sound-speed profiles and bathymetry are fitted with cubic splines (Solomon et al., 1968) or quadratic functions. The domains thus formed are rectangular, much like that in method (1) above. However, linear interpolations in range are performed between adjacent profiles to obtain continuous range derivatives. The differential ray geometry and amplitude equations [derived from Equations (4.4) and (4.5), respectively] are then solved numerically (Foreman, 1983). The proper use and application of complex range-dependent models requires a great deal of planning, especially with regard go the selection and spacing of the range-dependent environmental data inputs. Improper spacing of inputs can overlook important ocean frontal systems or bathymetric features (Henrick, 1983). Limited 3D ray-tracing techniques have been developed to account more properly for the effects of horizontal gradients of oceanic properties, which are manifested as cross-range variations in the TL patterns. Examples include the use of a hybrid approach involving horizontal rays and vertical modes (Weinberg and Burridge, 1974; Burridge and Weinberg, 1977) and the use of 3D Hamiltonian ray tracing (Jones, 1982; Jones et al., 1986). A compact, 3D ray-tracing algorithm suitable for implementation on small computers was developed by Einstein (1975). Bowlin etal. (1992) developed a versatile, range-dependent ray-tracing program (RAY) that is available from the Ocean Acoustics Library (OALIB) website (see Appendix C). A useful property of ray models is their ability to calculate arrival structure. Similar information can be obtained from wave-theoretical models, but only with much additional computation. Arrival-structure contours indicate the horizontal range from source to receiver that will be traversed by a ray leaving the source (or arriving at the receiver) at the specified angle for each propagation path of interest. These contours are not frequency dependent, but they do depend on the source and receiver depths. These contours are also referred to as 0-r diagrams. An alternative way of viewing these contours is that r represents the range at which a ray leaving the source (arriving at the receiver) at angle 0 crosses a horizontal line representing the depth of the receiver (source). To be properly utilized, these contours must indicate a reference to either the source or the receiver angle, and the sign conventions must be explicitly stated. For example, relative to the receiver, a negative angle (0 ) usually, but not always, signifies rays arriving from above the horizontal axis (i.e. rays traveling downward), and a positive angle signifies rays arriving from below (i.e. rays traveling upward). Arrival structure information is not just an academic curiosity. Fundamentally, it facilitates discrimination of multipath arrivals. 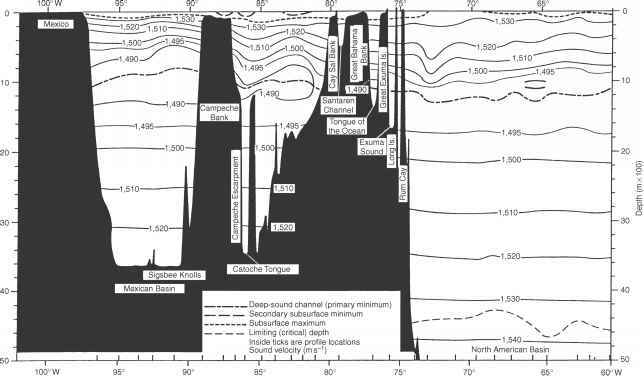 This information is essential for the proper computation of the vertical directionality of ambient noise (see Chapter 7) and for the proper evaluation of the performance of vertically oriented hydrophone arrays. Arrival structure information is also important in the calculation of volumetric and boundary reverberations (see Chapter 9).